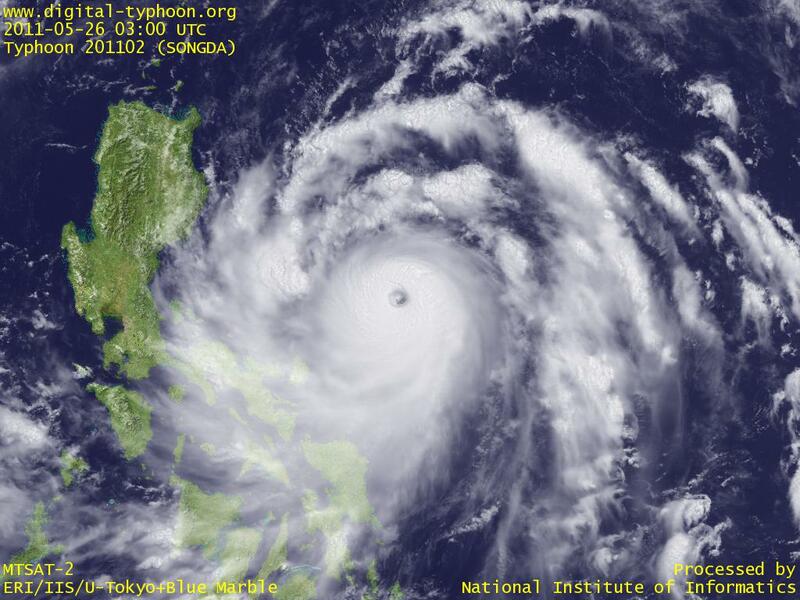 Typhoon SONGDA has passed its peak intensity in east of Philippines. In comparision to yesterday, the image below indicates that thick clouds around the center are decreased, and the eye expanded with less clear edges. It does not indicate, however, that the affect of typhoon is going to decrease from now. For example, the extent of heavy rains and strong winds may keep expanding, and the amount of heavy rains may increase as the northward movement of the typhoon stimulates the activity of "Meiu Front" that extended to Kanto area (as of today). This typhoon is forecast to draw near to Honshu, but this is relatively rare among Typhoons in May. In any case, many areas of Japan needs to be on alert for the typhoon. The first place is Sakishima Islands. The area will enter the gale wind area early tomorrow, causing heavy rains and strong winds. 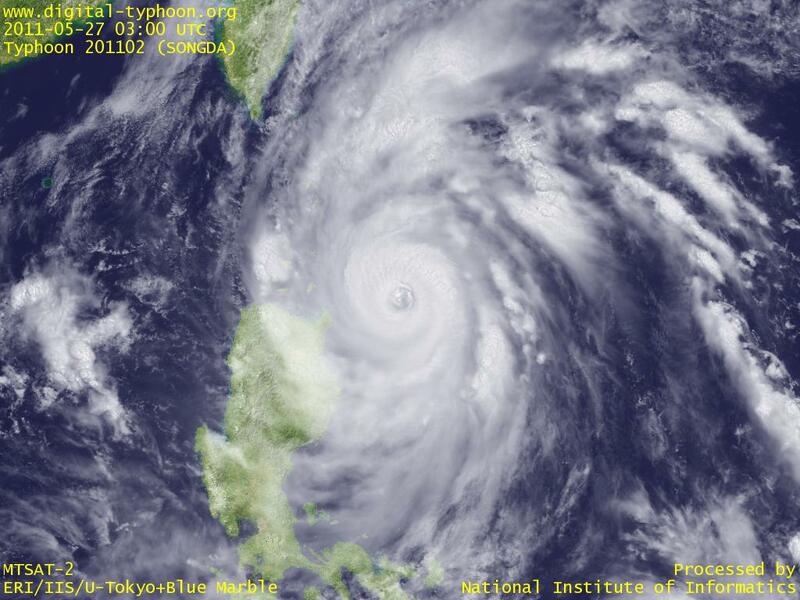 Typhoon SONGDA intensified to a violent typhoon off the east coast of Philippines. The typhoon increased the speed of intensification since yesterday, and it seems that now is near the peak of the intensity. The image below shows a small and clear eye, with very thick clouds surrounding the center. The forecast track goes from south of Sakishima Islands to Okinawa, so we need to keep watching on how it will draw near to Okinawa. Typhoon SONGDA was formed in Caroline Islands. Yap Island is now escaping from the gale wind area. This typhoon is forecast to intensify as it moves west slowly in the Pacific east of Philippines, so it is better to keep an eye on it.